Once you've had children, however, going just about anywhere with your little ones in tow can turn into a multi-step, elaborately-planned event, what with all of the extra gear and the need for a way to transport them when their legs just can't take walking anymore. But, what happens when you finally have your bag packed and ready and you look at your stroller and realize that there is no way that it is going to fit both of your kids or even withstand the trails and paths you want to hit? Those tiny wheels and that clunky frame can hardly be maneuvered through the mall, let alone spending a day at a state park, getting pushed for a jog or getting pulled behind a bicycle, right? Which is why the Joovy CocoonX2 Double Stroller is the single purchase that you'll need to make to take you and your kids right to exploring the great outdoors all year round with ease. A U.S.-based company that manufactures premium family gear products, Joovy's goal is to design and offer items that are extremely useful, practical, good-looking and fun. All of their innovative products have top-of-the-line features and use vibrant, high quality fabrics and materials — aspects that parents everywhere can definitely appreciate. 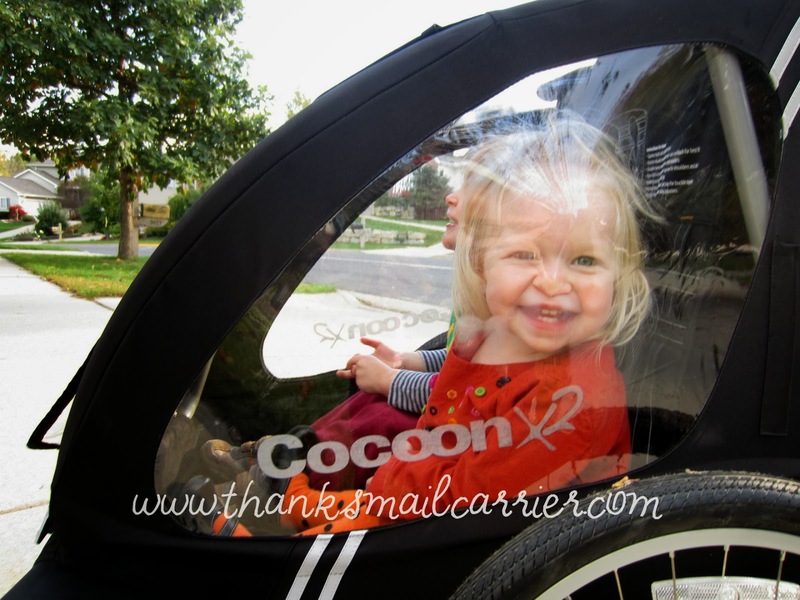 After having used the Caboose Stand-On Tandem Stroller for many years and then recently trying out the Foocot Child Cot, I was over-the-moon excited to try out the CocoonX2. 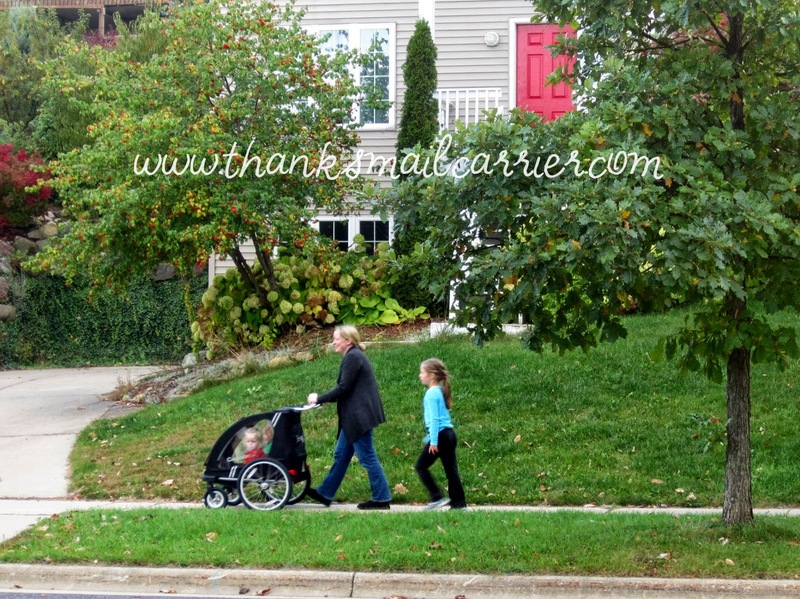 I have admired this stroller-jogger-trailer for ages and couldn't wait to see how well it would perform and if it could live up to my extremely high expectations. Right out of the (large) box, I found that the CocoonX2 had minimal assembly required before it was constructed and ready to go. 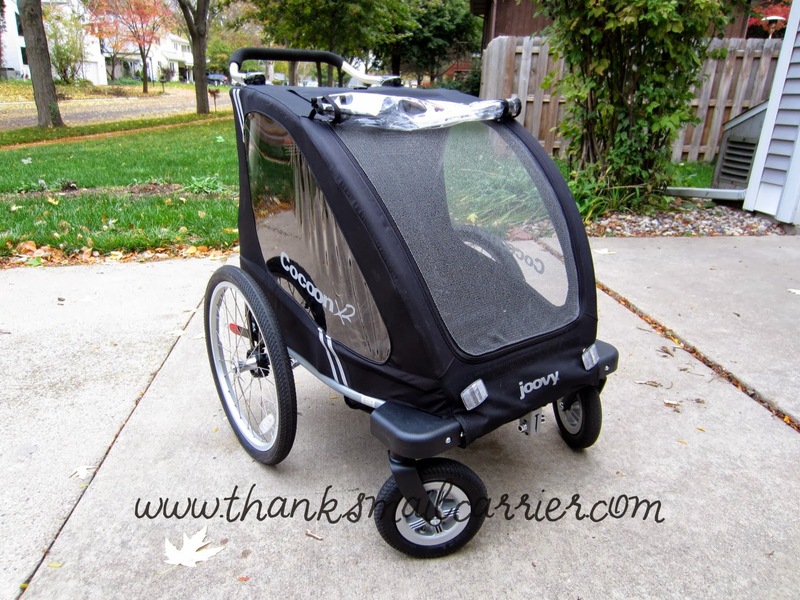 In around 10 minutes, I had all of the high quality materials snapped together and stepped back to see that Joovy had indeed created a product that would withstand multiple years and provide riders a comfortable, smooth ride. In the same way that some people ogle classic cars or luxurious fur coats, I found that I couldn't stop myself from running my hands over the CocoonX2 and marveling at all of the features. 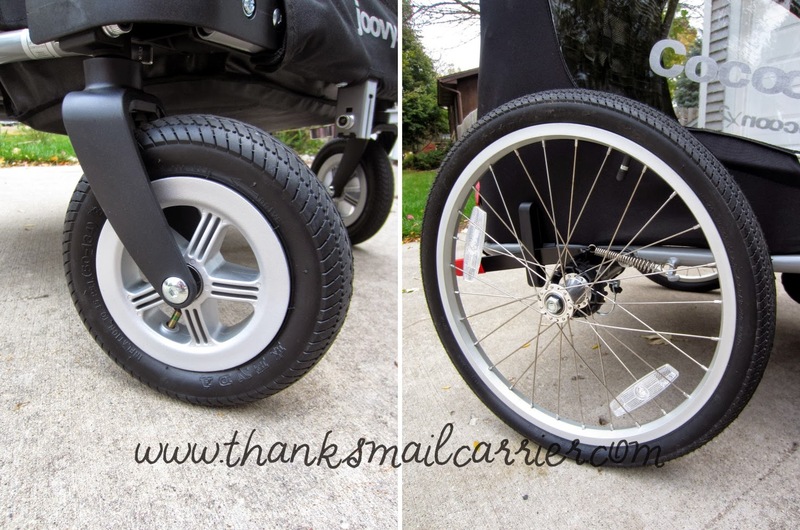 The pneumatic wheels (two front swivel wheels and two 20" rear wheels) make this stroller very easy to maneuver and provide an extremely smooth ride over all sorts of different surfaces — I have pushed the CocoonX2 on pavement, over sand, on rocks, across grass and more and it has conquered them all! But as well as making this an easy ride to push as a stroller, the wheels of the CocoonX2 are also one of the unique ways that make this a 3-in-1 stroller. 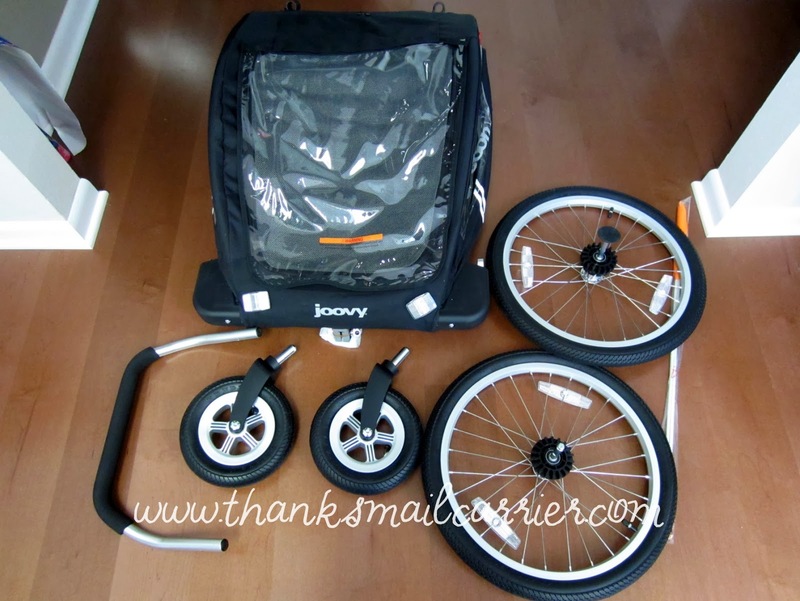 Remove the front two wheels entirely and replace them with the Joovy Cocoon Fixed Jogging Wheel (sold separately, $69.99) and head out for a run or quickly convert this into a trailer to be pulled behind a bicycle by attaching the Cocoon Bicycle Trailer Attachment (sold separately, $69.99). No matter where you want to go or how you prefer to get there, the CocoonX2 can adapt to what works best! When it's time to get out and see the world, Joovy didn't skimp on making the CocoonX2 comfortable and convenient to push as well as to ride. The cocoon-like compartment is so much more than a traditional stroller seat, with room to accommodate one child up to 100 pounds or two children who are up to 50 pounds each. 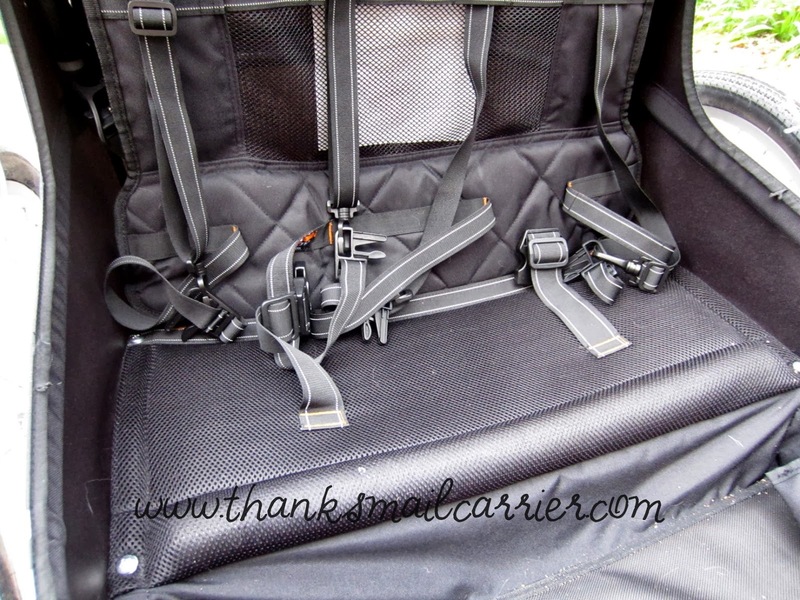 Instead of feeling as though they are being confined into a chair, the padded bench seat is more reminiscent of a miniature couch that just happens to have two 5-point harnesses attached. At the same time, there is plenty of legroom and all of the kids that we have taken for a ride in the CocoonX2 adore the two inner pockets to store their belongings. As well as keeping the comfort of the riders in mind, the design of the CocoonX2 is such that they will have no problems viewing the sights and can stay warm and happy in just about any temperature. ...and the zippered door on the front provides for entry/exit as well as ventilation. I love being able to zip down the mesh so that not a single bug can bother the kids, yet they can still feel the warm breeze on a nice fall day. 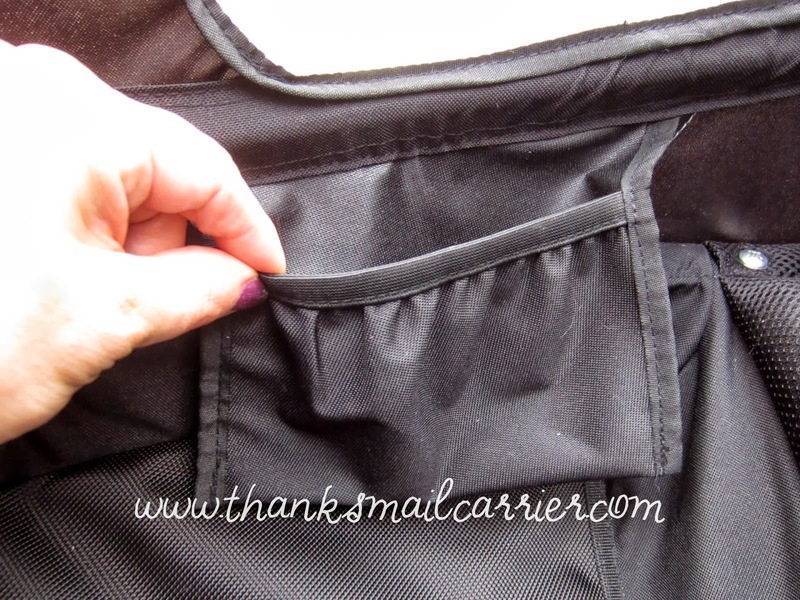 As an added bonus, not only is the zippered door convenient, it eliminates the hassle that all parents dread when their child decides to drop their sippy cup, stuffed toy or shoe out of the stroller! Plus, when the weather is less cooperative, there is a vinyl window that quickly rolls down and Velcros into place to keep away an unexpected shower, cool morning fog, winter chills and more. Instead of trying to maneuver a huge snowsuit and hat onto your child, simply tuck a blanket around them in the CocoonX2 and they'll stay completely content and out of the elements with ease. Joovy didn't forget about the parents when designing their unique CocoonX2 as well. 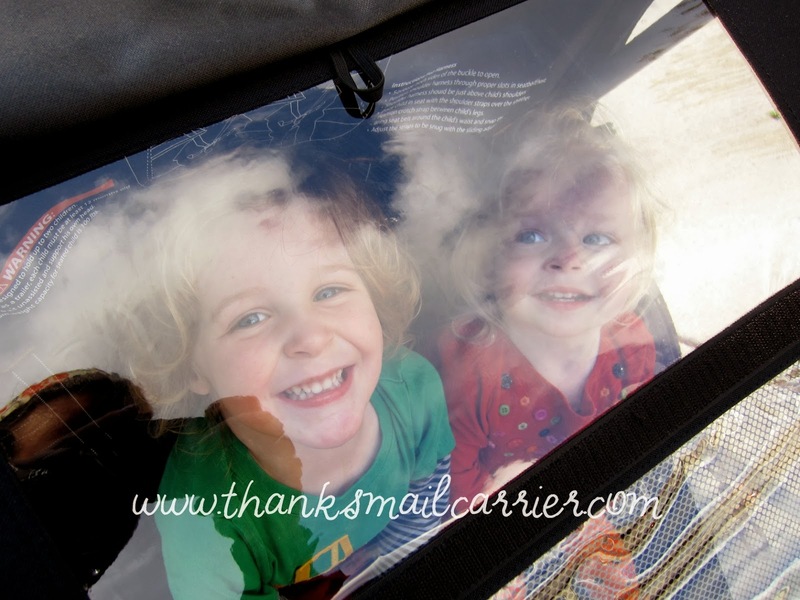 Along with the two position adjustable handlebar to accommodate taller and shorter adults, there is a great little peekaboo window (with Velcro closure and a toggle to permanently hold the flap open, if preferred) so that Mom and Dad can easily take a look inside to check on their passengers. Even better, right on the back of the CocoonX2 there is an extra large storage compartment with a zipper closure of its own. With a quick zip you can easily store bags, food, playground toys or just about anything else that you might need when venturing out! 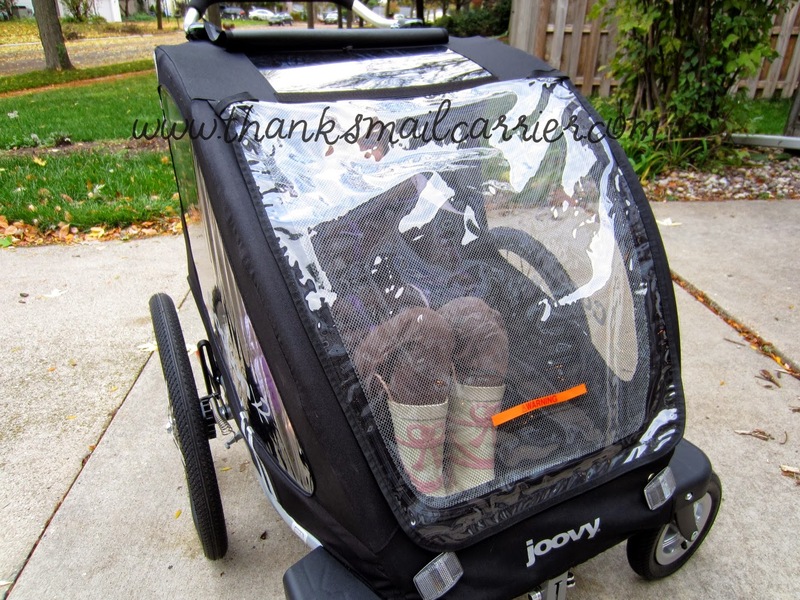 There's not much else that Joovy could have done to make this a more perfect double stroller! 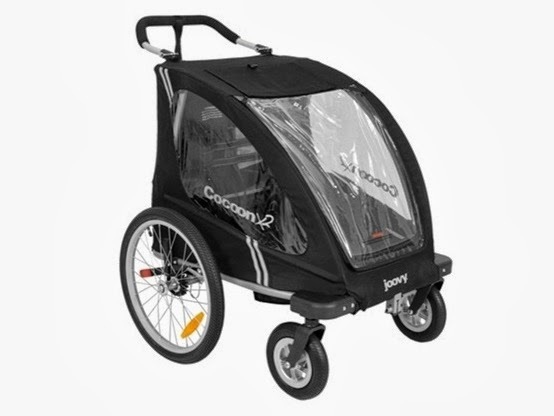 The way it easily converts to a jogger and a bike trailer, the dual rear parking brakes to securely stop movement, the reflectors for nighttime safety, the comfort and versatility of the cocoon seat, the large storage compartment and weight limit... everything comes together to make this such a well-designed, high quality, convenient, unique piece of gear. 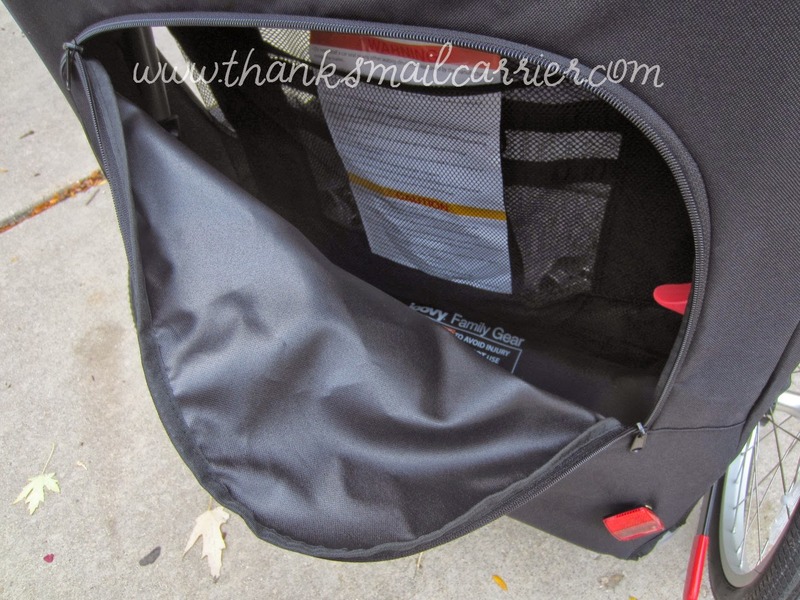 The only thing that I've found that this stroller is missing is cup holder for stashing my cell phone (so that I don't have to stop and open the storage area every time I need it), but that would be easily resolved with the addition of the Cocoon Parent Organizer (sold separately, $39.99). Then it would definitely have it all! The CocoonX2 is definitely not a small stroller (41"H x 31"W x 40"L) but I have found that it does fold down when needed and that the 31" width hasn't been a problem with standard doorways or walkways. And, while this stroller weighs 35 pounds, I have been told by parents with "traditional" double strollers that the CocoonX2 has proven much lighter and easier to push than their classic model. 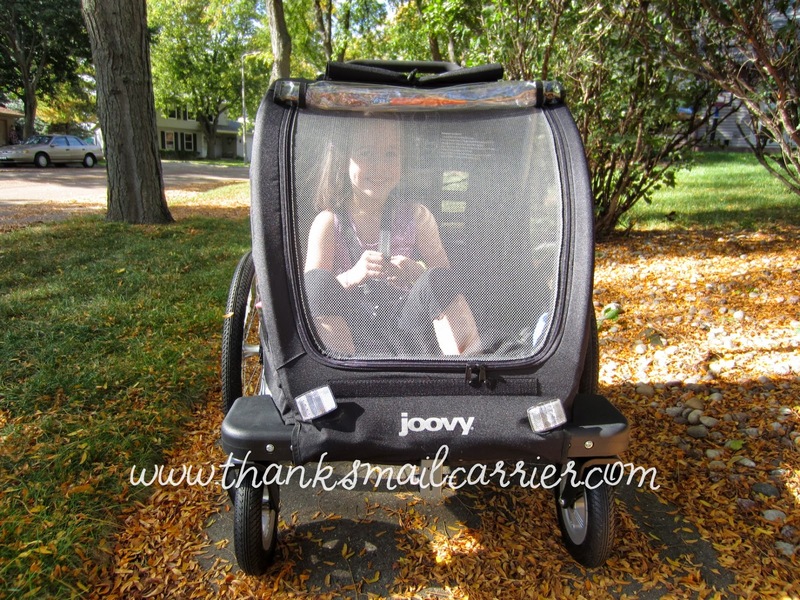 The Joovy CocoonX2 does have a higher retail price of $549.99 (available directly from Joovy or on Amazon), however, I believe that this is unlike most other double strollers on the market and would be an extremely great investment for an active family. Walking, jogging and biking in one? Where else are you going to find something so versatile? Find out much more about the CocoonX2 and all of Joovy's high quality products by visiting them at Joovy.com and connecting with them on Facebook and Twitter. Other than the CocoonX2 that I received from Joovy in order to facilitate my review, I was not compensated or enticed to do this review in any way. This post is solely my honest opinion about this product. My husband would love to have one of these so he can take the grandkids out for a ride. Wonder if you could use it with a tandem? Then we all could go together! I wish they had this stroller when I was raising my kids. My husband made a contraption that linked the two strollers but it was heavy and clumsy to maneuver. I think this was invented by someone who was a parent and an outdoor enthusiast. They've thought about everything. This is amazing! I want it. Great photos. 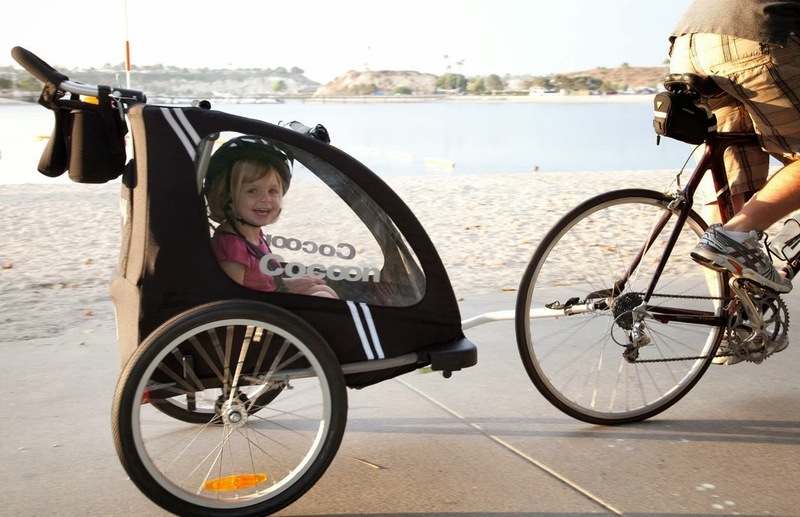 This is so neat that it can be used as a bike trailer and then put wheels on the front as a stroller! My grandsons would love to ride in this! What perfect timing! Our new neigbhors are a lovely couple from Vietnam (I mean just very recently!) with an adorable 11 month old daughter. They are used to riding their bikes pretty much everywhere. But here with their new baby and somewhat colder weather they've been mostly using the stroller for walks and a car for just about everything else - even visiting friends and/or taking the baby with them to work (at the university - about 1.5 miles away. The dual/convertible style of this stroller/trailer make it so versatile and well worth the price. This is great. My sister is looking for one of these and I had her look into this one because it was about the same price as the BOB she wanted.